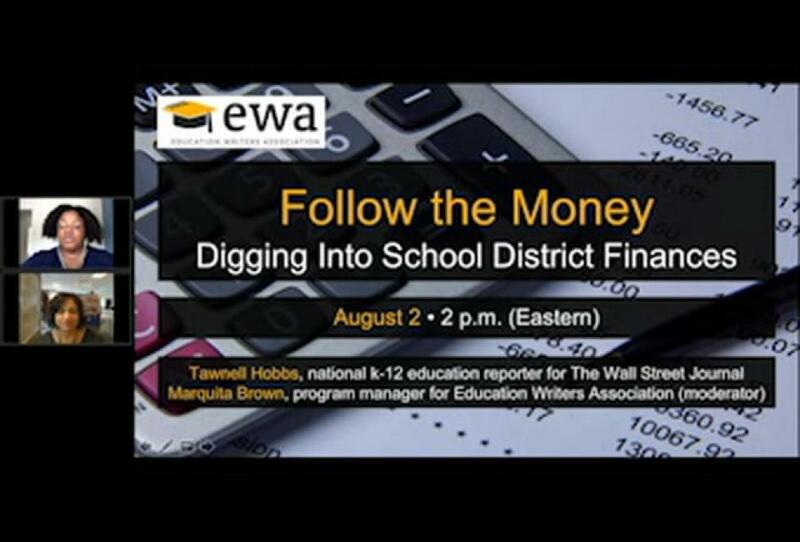 Burnette and Pittsburgh-based education reporter Mary Niederberger, an EWA Reporting Fellow, outlined the basics of school funding, why it matters, and how it is a factor in the perpetuation of inequity during the EWA event. “It’s complicated, but it’s not impossible,” Burnette said of writing about school finance. Money isn’t everything, but it matters. In 2018, Education Week produced a special report on school finance that graded each state on overall spending for schools and funding equity (e.g. how fairly money is distributed). The top-ranked states were Wyoming, New York, New Jersey, Connecticut and Rhode Island. The lowest-ranked states were North Carolina, Arizona, Utah, Nevada, and Idaho. The report also included an in-depth analysis of the issues, including an article by Burnette that sought to unpack the ways funding can exacerbate inequities, and efforts to reverse that. While political wrangling over funding allocations for schools is a longstanding issue in education, turnover in political leadership in states and localities as a result of the 2018 elections could affect how budget struggles pan out for public schools. A surge of teacher activism might also affect budgets, putting more pressure on officials to raise overall spending, including by increasing educator salaries and paying for smaller class sizes. Who spends more on schools in your state? The state or local government? How old is your state’s school funding formula and what are the implications of that? If your state is exploring new sources of revenue for schools, from casinos or a tax on legalized marijuana, will the new funding increase or just supplant existing funding for schools? Are teachers in your community pitching projects on sites like Donorschoose.org? If yes, what are they proposing? Even political debates over healthcare have implications for schools. Federal Medicaid dollars often go toward special education services such as counseling and speech pathologists, Burnette said. Journalists need to understand the politics as well as the basics of school funding. Taxpayers contributed nearly $680 billion for K-12 public schools in the 2015-16 academic year, according to new federal data from the National Center for Education Statistics. (That’s the most recent year available.) State and local governments provide the bulk of that aid, with 8.3 percent coming from the federal government. Most of that money, about 80 percent, goes toward salaries and employee benefits, according to NCES. Journalists should also get familiar with the language of their state constitutions regarding the right to a free public education, Burnette said, as well as state funding formulas for schools. These formulas dictate the allocations of funds to public school systems. What incentives or penalties are lawmakers enacting to affect classroom priorities? Are lawmakers considering weighted funding formulas, which factor in higher costs for students who come from low-income families or are otherwise disadvantaged, and the higher costs of meeting their academic needs? How old is the state funding formula? “The average school funding formula is 20 years old. Most research would say they should be replaced every 10 years,” Burnette said. But in some states, such as Delaware and Iowa, the school funding formulas are much older. Niederberger examined the effects of funding inequities across school systems in Pennsylvania in an investigative series for PublicSource, a nonprofit online news outlet based in Pittsburgh. (Her series, “Failing the Future,” was supported by an EWA Reporting Fellowship.) A key issue in Pennsylvania, she said, is the especially heavy reliance on local funding for public schools. For one story, she honed in on financial disparities between two adjacent school systems, Sto-Rox and Montour, driven by the gap in local property tax revenue. Sto-Rox has five public housing projects, which don’t bring in property tax, and “is nearly void” of industry or significant real estate development. Montour is home to a large shopping mall that brings in a lot of property tax dollars. “We’ve learned to live without a lot,” a Sto-Rox Junior-Senior High alumna told Niederberger. Contrast that with Montour Senior High, a “sprawling” building that holds “a coffee shop, art gallery and empathy room, a quiet place with couches where students can talk and post messages encouraging acts of kindness on the wall,” Niederberger wrote. Montour Senior High recently underwent a $50 million renovation. Alumni at Sto-Rox Junior-Senior High recently raised $600,000 to install artificial turf for the school’s football field, only to learn they fell $100,000 short of the installation cost. Such stark disparities in funding and resources affect more than whether a student at one school enjoys a latte while one at another school makes do with a Xeroxed novel. Emerging research indicates the effects of policies and actions that create or exacerbate concentrated poverty in schools, Burnette said. “The more you compound poverty, the more expensive it becomes,” he said. Niederberger advised reporters to get a better grasp on local funding, which can provide context and insight to funding disparities. Pay attention to district budgets, looking for details such as whether a school system has a fund balance or deficit, she said. It’s also valuable to understand millage rates, which are used to calculate property taxes, she said. One mill of taxes equals $1 for each $1,000 of assessed real estate value. Niederberger examined the data for the Sto-Rox and Montour school districts, and the contrast was stark in their ability to raise local revenue. A mill of taxes in Sto-Rox yields about $307,000, she noted in her story, while a mill of taxes in Montour reaps $2.7 million. Property-poor districts in Pennsylvania often have to raise taxes to generate more money, Niederberger said. But that comes with a cost. Typically when poorer districts raise taxes, the delinquency rates increase as well, she said. Journalists should ask tough questions of officials after policies or actions such as rezoning that cluster children from low-income families in certain schools, Burnette advised. For example, how much more will it cost to provide the additional resources those schools will need to offset the effects of poverty? Don’t just report on the numbers. Paint a fuller picture of how funding, and any related disparities, play out in schools and classrooms — things Niederberger did in her series on school funding. “The students are really aware that they do not have what other students have,” she said.